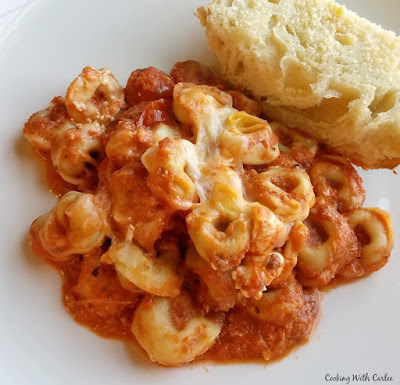 Comforting, cheesy, flavorful goodness! 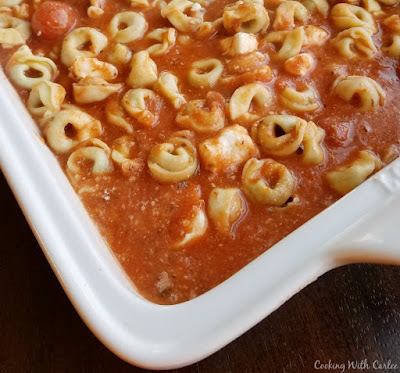 Cori's baked totellini casserole is sure to be a favorite dinner at your house as well. 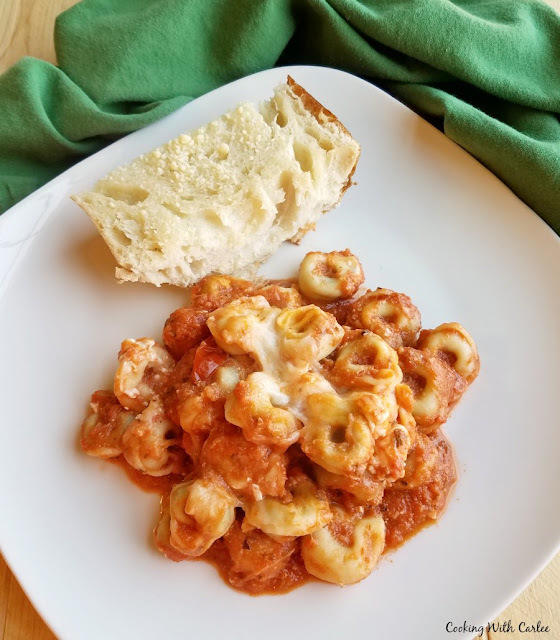 It's perfect for meatless Monday or Lent, but of course you can add meat if you'd like! I have been looking forward to making this for a while now. My cousin Cori emailed me the recipe and it sounded so good. Every time I planned to make it, something came up. So when I was looking for a meal that would leave me with leftovers, this seemed like the perfect time! Nothing came up and I finally got to have it! I followed Cori's recipe pretty closely. The only real change I made was adding some sliced roma tomatoes on top. We love fresh tomatoes in our pasta and I happened to have some tomatoes on the counter. I needed to use them because I was going to be out of town for the next few days. So it just seemed like the right thing to do! We all really enjoyed it and there is some in the fridge for my husband and Little Dude to eat while I am out of town. It makes me feel better knowing they have something easy to heat in case they don't feel like cooking. Be sure to have some crusty garlic bread or some whole wheat cheesy bread on hand and you will be a happy camper! 2018 update: We still love this yummy pasta bake. My husband of course didn't remember eating it before. He was already laughing at the fact that I said he didn't have a good memory when it comes to this stuff in the salmon patty post. He actually has started reading the blog and now he knows that I talk about him. Ooops! But it only made it that much more funny when he proclaimed that I should quote him as saying that "the cream cheese was a delightful touch" when I write the post. Little did he know that the post had already been written, three years ago! Luckily both he and Little Dude loved it the second time as well. We were all soaking up the extra sauce with our garlic bread and enjoying everything. I definitely need to put this in our rotation more frequently. This would also be a great take and bake for families with new babies or illness etc. 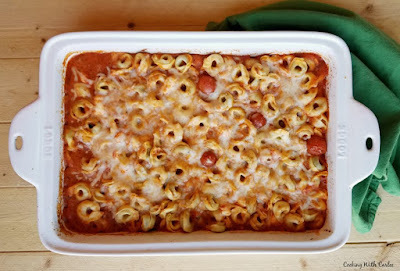 If you have a family of baked pasta lovers, we have a lot of great recipes. We are big fans! You may also like MiMi's baked ziti, or Maw-Maw's not quite traditional lasagna. For something really different you may try the creamy buffalo chicken lasagna or pulled pork spaghetti. Or just make two batches of this, it won't go to waste! Preheat oven to 350 F and grease a 9x13" pan or 3.5 quart casserole. It's worth a shot! Thanks for hosting! 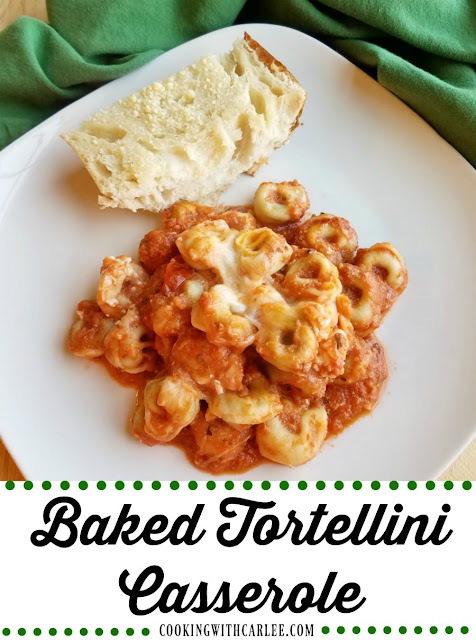 I must admit that I love tortellini. Thank you for sharing a quick and easy recipe at Snickerdoodle Sunday! Delish! Thanks for hosting! It is sooo good!